Water wheels have been used through the ages not only to pump water but also to produce power to cut wood and grind grain. Water wheel pumps are commonly used to provide water in areas where safe drinking water is not easily available. 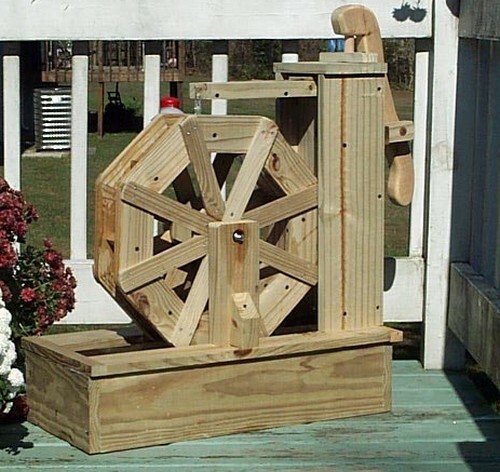 Here is how you can build your own water wheel pump. Designing – Firstly, design the structure properly. Use wooden planks or pieces of cardboard for this purpose. Draw a straight line at a distance of 2″ from the border of one of the wooden planks and divide this into 10 equal segments. These will be your paddles. Then, with a protractor, draw two circles. The centers of these circles are the points where the axle will connect to the two parts of the machinery you are building. These pieces should be marked out according to the size of your water wheel; you don’t want to have a badly balanced wheel! It is important to get these measurements correct. Making the Stand – Design the stand for your water wheel. This is the least technical section of the entire process. Give it as much height as you want. The usual shape is to have two large triangles stabilized with a supporting beam. You can even add an optional base for added support. The water wheel will fit into the groves provided in the stand. Cutting the Sides – The wooden planks you have marked previously need to be cut with the help of a saw or cutter. Paddles – The paddles are to be placed at an angle of about 40 degrees from the two halves of the water wheel. Use glue to fix the paddles in place. A skewer needs to pass through the centers of the two sides of the water wheel. Bringing the Water Wheel and Stand Together – Place the water wheel on the stand. If you want to use your water wheel for water supply purposes as part of your garden, you may need to build a bigger one. Attaching Buckets – Attach buckets to the axle of your water wheel and check its performance. Now your water wheel pump is ready to pump water. The purpose of the water wheel will determine what size you need. Make sure the stand is capable of supporting the weight of the water wheel. Use tools carefully and keep your hands safe with gloves.